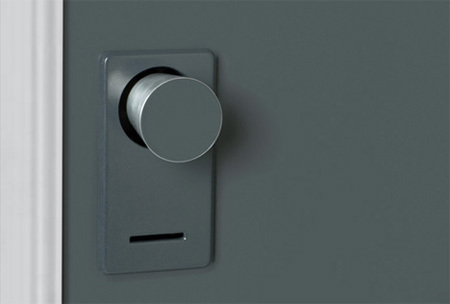 Innovative door handle system, designed by Arnaud Lapierre, promises to ensure your privacy by hiding the knob when the door is locked. Doorknob Condition uses clever pulley system that retracts the exterior door knob when pulled from the inside. That’s pretty sweet… Although is that a keycard slot for getting in from the outside even if it is locked? Wooow that’s really ingenious, I love it! Great design… adds security when the door is locked, instantly shows the state of the lock, and looks cool. The only problem i see with this nice solution is that somebody outside might get his fingers squeeze when trying to open the door while somebody is inside and just pulling the knob. As is often the case, some of the best ideas are some of the most simple. Genius. I can see Fire Marshalls pitching a serious fit about these. They are interesting though. OOOH!!! I love the security…and the privacy! Let’s go buy one and test it out! Okay, now THAT is cool and ingenious! Not like that paper sneaker thing. just a waste, complex mechanism leads to failure, since the knob should carry pull/push force and turn force …. I love it! Where can I buy? Yes i totaly agree with Critical Eye! Nice add on security and a great way to see if a door is locked in big toilet rooms! What if you were to suction cup that end and pull back…? It’s nice for toilets, but a stupid concept for any other door since it clearly tells you whether someone’s inside or not (unless of course you can push it in from the outside as well) which provides a nice invitation for burglars. Interesting idea, though I doubt something like this would ever be picked up simply because of the potential for abuse. What’s to keep someone from putting the handle in ‘backwards’ and using it to keep someone in, rather than out. A door lock is only as good as the door jamb. if the door jamb is weak so is the door. I don’t think this lock is so much for security as it is for novelty/privacy. that being said, I love it. 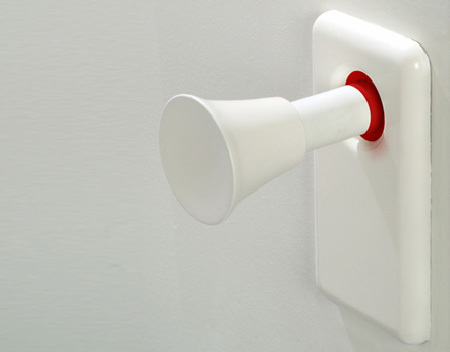 fun, interesting and functional design. it will sell very well if the pricing is right. great job! where is the latch though? Just to say, these would be illegal in the UK. A While back fire fighters went into a building and saved those in need, in their line of duty the door closed; the door handle was flush to the door itself, making it near on impossible to find the way out(shortened adaption by me to get the point across). Those firefighters died because they couldnt find their way out, and eventually ran out of oxygen. LOCKING THE DOOR prevents people from getting in, EVEN PEOPLE WITH SUCTION CUPS. The retractable knob is just so people don’t go TRYING to open a LOCKED door. The knob itself doesn’t lock the door. The lock locks the door. The knob is just to make it clearer that the door is locked so people don’t try to open it, which from experience is really annoying. It’s a smart idea. Why would a visibly locked door be any different from a locked door from a burglar’s perspective? A locked door is a locked door. Burglars can always knock to see if anyone’s inside, if there aren’t, then it’s time to rob. It’s not as if a normal door will be more burglar-proof than this. This is a good idea, kinda like putting a ‘do not disturb’ sign; people trying to open locked doors is annoying when you locked the door because you want peace and quiet. Door knobs need to be replaced entirely. Hate having my hands full while faced with a closed door. I can see allot of serial killers are going to order these knobs, alright. Where can I get a few? haha I joke… about buying of course; but not former. I think a lot of you miss the point, I don’t think this is the type of door knob that would ever been used on the outside of a door to begin with, so it would never be an issue with burglars. You need much more heavy duty knobs for outside doors. For and inside door, its a cleaver idea. I think especially if you have small children and were able to push the knob in from the outside. I would think over the next 10 years that these innovative door knobs will become the standard of the motel/hotel industry. Something we could use in good old SA. Wow some of these comments really show peoples stupidity! “Does it work the other way around?” look at the pics genious! I do believe it says PROTOTYPE for all you with the rediculous comments about the design. The design is awesome. Ensures privacy and i luvs it. Design the entire door and that flat area of the doorknob to match the wall. Decorate onto that side of the door inconspicuous things. When the door knob is pulled in, it blends into the door, and the door blends into the wall … and voila .. not only disappearing doorknob, but also disappearing door. My mind is officially blown. Wow. Ancient with +infinity defense lmao. Yeah it’s interesting but it’s not going to stop bad people who have suckers who can pop the handle back and attack. I don’t think this is a sufficient locking device. If the knob can be pushed in from the outside, if no-one is the other side of the door the door can never be opened again! This would be very easy to do accidentally / deliberately in a toilet or something (which yes is the main possible use for these). If the knob can be pushed from the other side, then there’s no means of turning it, and no means of getting in to turn it, ergo, no more door opening. Jeez. Cool design, but wouldn’t it be easy to inadvertantly lock yourself out of the room if the door should shut in the retracted handle position? I think that there is something that prevents the doorknob to be pushed in from the outside and lock yourself out, there is just no way the designer(s) didn’t think of that, and I think it is a pretty good idea, I would buy it ! also I assume this knob is not suitable for front doors and than there is no problem with burglers, not that it would make it any unsafer from burglers if it was ! In the US when you go to a hotel, you get a door knob hanger to put outside your door on the knob. One side says “do not disturb” to let house cleaning know they shouldn’t come in. the other side says something like “please clean” to let house keeping know they can come in during their daily route and clean the room/make the bed etc. If hotels had these knobs, the person inside simply pulls in their knob. No more millions of paper door knob hangers printed each year! @jodie_nodes – yeah dude, most cats carry a suction cup around with them….gum?! Seriously? WTF yo. Hey here’s a thought, maybe if they don’t have a suction cup the will have The Jaws of Life in their pocket< they can just clip it off…..moron. I am amazed by the number of people that comment saying that it would alert someone that you were away. Don’t they lock the doors when they go to bed? To the people saying waaah this wouldn’t stop a burgular etc … get a clue. It’s for PRIVACY. i.e. if you’re in there doing the deed with your wife, you don’t want some random kid/relative/maid etc. start jiggling the knob and have your lady immediately jump off your er… basically it can be a total mood killer when someone disturbs you like that. Then you have to answer them saying “just a minute” or make some excuse. Instead they get the message right away with this. Oh and how is this a fire hazard any more than a regular lock? You have to break down regular locked doors if no one opens them from the inside, and you have to break these as well? WHAT’S THE DIFFERENCE GENIUSES? I like this from a design point of view, it would be ‘nice’ to have it inside the house. We would like to use these is a restaurant concept we are currently working on. How can we make that happen?? They look amazing! this would be perfect for the nights when my dad gets drunk and tries to get in my room while I’m trying to sleep. How would a fireman or an ambulance driver get in in an emergency? Actually, this is one of the most ingenious and time saving ideas. Privacy? Clearly shows that this door is not meant to be open at the moment. Fire hazard? It’s actually an ANTI-fire trick, because with this lock, firefighters actually KNOW there is someone inside and that the door is locked, hence they know that this door IS to be knocked down. Brilliant design, I love it. Okay, I just wanted to say that it is not a fire hazard because the door knob is only “not there” when the door is locked, so it is only as much a fire hazard as any locked door is. Get drunk once and never get back in. what happens if the doors closes and is locked and your on the side without a handle, and it is a small closet, do you have to kick the door out and broken, due to an unfortunate mishap, and what if your an 80 year old woman who lives alone, just sit there and die??? Put a magnet on the stainless doorknob and pull it out. Twist then break in. I think it’s a cool idea, but what if there’s nobody in the room and you just push it??? how would you open the door again? This is not a fire-hazard! Fire fighters would have to break down any locked door, regardless if it had a handle or not! So it doesn’t make it any more dangerous. In fact, it makes it safer, because if there’s no handle, you know there’s someone inside for sure and the door should be looked at first before other rooms!!! Second, so many people say it’s stupid because if you lock the door and then close it while standing outside you can’t open it again. What if it had a handle and you did the same thing? 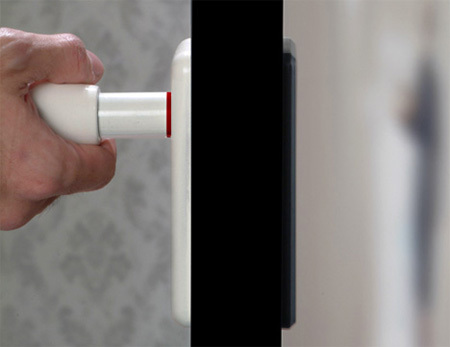 How does the handle help you to unlock a locked door? See the stupidity of your arguments? The handle doesn’t help in unlocking a locked door. Someone said what if your child locks themselves into a bathroom. How will a handle help you get them out any faster? In fact, with this door, you’ll know for sure that your child is IN the bathroom. If you had a traditional door with a traditional handle, you’d have to knock and listen for their response! This door handle makes it easier in those cases, too. This is all around a better solution!!! It will save lives. That’s an amazing idea. ROCK ON! Pull knob slowly and fingers don’t get pinched. Also to keep criminals from pulling the know back out… Use a spring loaded pin located in the center of the inside knob to be pushed in momentarily while returning the knknob to normal operating position. No finger pinching that way. 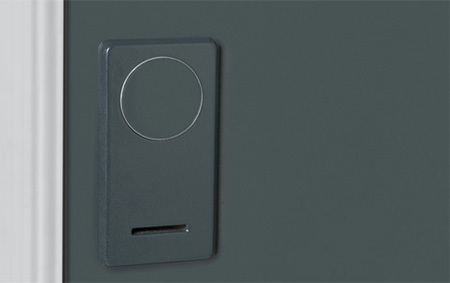 Tron, If you install this door knob backwards on a small closet, you deserve to be locked in, 80 year old woman or not. This handle serves no purpose on a closet. To everyone worried about getting locked out-because this handle is mainly designed for restroom stalls and works on a pulley system, it probably would accept any card in the slot. The card more than likely hits a lever and releases the handle allowing a parent or medical personal to open the door if someone can’t open the door themselves. The purpose of the door knob, is to alert people that whatever exists on the other side is occupied. To the best of my recollection, security, other than privacy, wasn’t mentioned in the description. I’m sure you can only pull the white handle in an only lock is from that side, But the thought of being able to use a suction cup to open from the silver side is a thought although I’m sure the card slot has something to do with unlocking it from the silver side… so maybe I just answered the question can you use a suction cup to open it from the silver side!!! I believe this is a great idea that way it is noticeable the room is occupied. Would love to buy one for my bathroom. When I saw this it was God himself sent that to me… I have unknown persons coming into my home even with security…somehow they are getting pass it… I really believe this will be the only way to keep them out … No other lock has stopped them …I have changed my locks 4 times In 6 months and it is breaking the bank…I live alone and they hurt my three dogs …animals don’t lie…. How do I get one or two or three????? Umm but if everyone had this doorknob and forgot to lock their door, it would be an easy target for break-ins because it will stand out from other houses.